For the past 7-8 years, farmers in Cameroon have been having a hard time knowing when the rains will begin or end. As a result, they have to plant their farms several times from February up until April or May when the rains begin. Traditionally, 45-year-old Abiadng Solomon, farmer in Bafoussam (cultivating market garden crops, cereals and tubers), wives and 13 children used to plant maize after the early rains of February. This year like in the preceding ones “women planted corn three times before seeing it appear”, says Mr. Abiadng. From February to May, Mr. Abiadng has counted six times that the rains have touched his 1.5 hectare farm. Instead of making him some good, “the six rains that has fallen brings flood to my farms. It fell heavily and damaged all my cabbages and tomatoes. I did not harvest anything," he complains. This is not the first time he has seen his farm crops perish because of the changing climate. He pointed out that in 2011, his inputs were more than 300 000FCFA (457.35 EU) on onions, but output was zero because the rains went earlier than expected (in September-October). 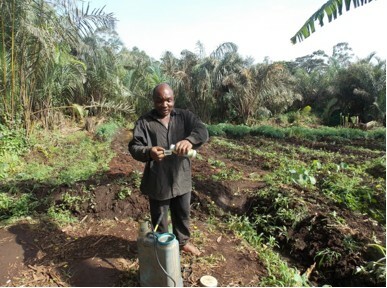 Farmers like Mr. Abiadng and peasants in Cameroon continue to feel the impact of climate change. The rains are irregular and unpredictable and when it rains, floods come and damage their farms and crops. Although reports from the World Bank say climate change risks are higher in poor countries, other reports from the University of Notre Dame say Cameroon and other African nations are the least ready to fight climate change. Cameroon is conscious of the dangers. Besides agriculture being the backbone of her economy, the country needs to fortify her climate change efforts in order to preserve the sector, which employs 60% of the population and provide 45% of the GDP (2010 national statistics). Through the Ministry of Agriculture and Rural Development, the government of Cameroon actively sensitizes farmers in specialized schemes like the maize, cocoa and coffee programmes, where farmers are given incentives and up-to-date information about climate change in Cameroon. The government also provides information to farmers via the Institute of Agricultural Research for Development (IRAD) and the National Institute of Statistics. To make sure climate and weather predictions are available for useful decision making, Cameroon has 15 meteorological surveillance centres. “We offer current meteorological information. We can offer information about the climatic conditions for 1 year, 6 months or the present situation,” says Mr. Mukete Mboye Simon, Commander of the Bafoussam Airlift (one of the surveillance centres). Persuaded that improved weather prediction is strategic to agricultural and economic stability, Cameroon’s Minister of Transport, Robert Nkili joined Ministers in charge of Meteorology in the Central African Sub-region in Yaoundé on April 24, 2015, to announce the creation of a Central African Meteorological Hub. Scientists in Cameroon are also involved in the fight, both on the field and in the media. In 2013, scientists at the Centre for International Forestry Research (CIFOR) in collaboration with Cameroon Radio and Television (CRTV) set up a radio programme on the CRTV called “Aurythme des saisons”, or “Following Changing seasons”. The monthly broadcast was put out to “help both policymakers and local communities with information to help implement policies and projects for adaptation to climate change and reduction of carbon emissions in the forests”, said CIFOR. Their recent report shows that they succeeded “an average increase of 22.3% on test scores in climate change and forest topics for an individual who listens once” to their programmes on radio. However, since the international governmental response to climate change of the UNFCCC began with the Kyoto protocol, in 1992, Cameroon is one of the 196 nations involved in the climate change negotiations. In December 2014, the stakeholders in Cameroon and other African negotiators pledged for zero net deforestation by 2020 in Lima. The rain fell heavily and damaged all my cabbages and tomatoes. I did not harvest anything he complains. The rains are irregular and unpredictable and when it rains, floods come and damage their farms and crops.